It was educational. Ms. Jackie Ranston, Jamaican author and historian, presented His Majesty with her recent publication, Belisario: Sketches of Character as a tribute to the legendary Nzema King of Prince's Town, Gyane Konny. Konny is celebrated annually in Jamaica, the Bahamas, Belize and other Caribbean nations as the "Jonkanoo" festival. It was historical. For the first time in history, an African King, Nana Kunudmuah IV, performed a traditional African atonement and reconciliation ceremony on US soil. His distant cousin, Howard L. Robertson, Jr., now a chief and heir to the throne, stood in amazement as His Majesty perform this sacred rite by placing drops pf lamb's blood on the feet of both men. King Kundumuah IV, then pressed his sword against his chest three times before embracing him, three times. 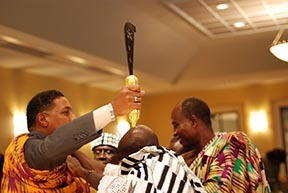 Immediately after the ritual was performed, the members of the Royal court, Richard Cudjoe, Sebastian Essien and Kaku Aluade (President of the Fredericksburg-Princes Town Sister City Association in Ghana) wrapped Robertson in Kente cloth with the symbol of crowns carefully woven in. Robertson, was led in dance by Essien and soon members of the audience participated in the celebratory dancing. Robertson joined the Royal court at the head table where he was congratulated on reuniting with his family by Fredericksburg City Councilman Rev. Hashmel Turner, Jr. It was emotional. Paula D. Royster, President and CEO of CAAGRI, described how her journey began in 2004 in a cemetery in a small town in East Texas. She dedicated the program to her great grandfather, Rev. T.J. Alexander. Royster said after feeling defeated and hopeless that she would ever find the final resting place of Alexander, she tried one more time and when she did, she was able to locate his headstone that had the word "HOPE" inscribed at the top. "That moment", she said, "changed my life forever." Robertson said he had wished his father were alive to see the day that the family's roots would be traced back to Africa. For him, the emotion of electing Barack Obama as the nation's first African American President and meeting his distant cousin form Ghana was too overwhelming to describe. His Majesty's only comment was that he could not believe all that he was seeing and looked forward to Robertson coming to Prince's Town to visit the rest of the family.